On a recent flight from Hong Kong to Singapore I flew Business Class to sample the Singapore Airlines Book the cook service. This service allows you to pre-order a meal from a selection of meals depending on where you are flying to and from. It takes the hassle out of making a decision inflight, and you can select exactly what you want to eat. For my latest Singapore Airlines review go here and here. Veal fillet, Steamed cod, Seared chicken and Fried pork. First up the drinks service begins and I choose the ‘Silver Kris Sling’, in addition, there are wines on the menu from France, Australia, Germany and Port from Portugal also available. The first course is served, and it’s a Nicoise salad with marinated seared prawns, and it’s just delicious. Not long after finishing my salad the cabin crew member confirms my pre-order meal choice, which is delivered promptly. It’s restaurant quality the meal looks fantastic and for an inflight steak tastes excellent there’s only one problem, it was rather lukewarm. I still ate the dish as I didn’t want to cause a fuss, but the cabin crew member knew something was wrong with the meal and asked for feedback. I explained it was a little cold and without hesitating the crew member sprung into action to rectify the situation. To compensate for the issue I was given a piping hot dish of fried pork with Chinese vegetables, I really enjoyed this meal. 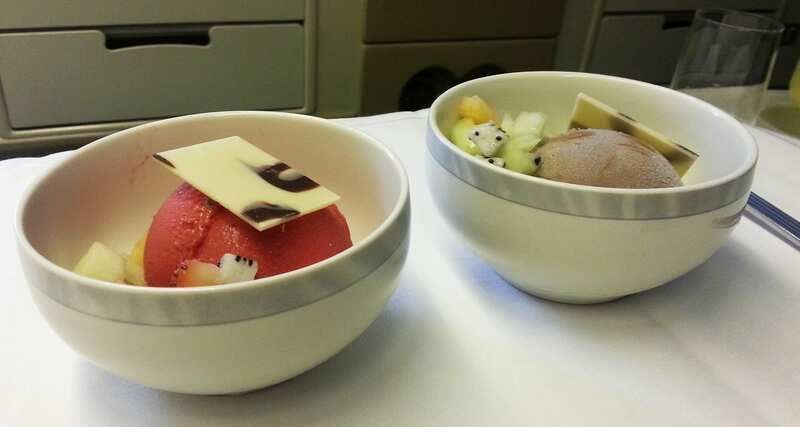 For dessert, there were options of Haagen Dazs frozen ice cream either raspberry or chocolate. Without being asked what flavor I would like the cabin crew member placed one of each flavour down my meal tray. This wasn’t served from the typical Haagen Dazs packaging, it was plated up, which is a really nice touch. 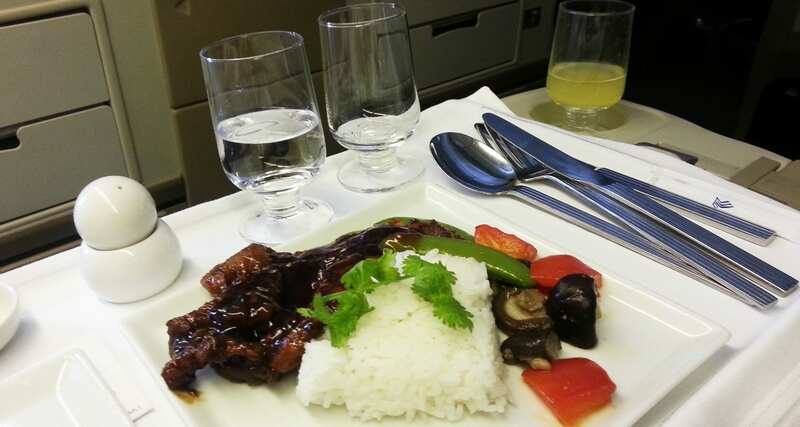 It’s great to be able to pre-order your main meal even in business class. The service was fantastic as was the service recovery, there’s a reasony why Singapore Airlines is one of the best in the sky. Which I saw with my own eyes on this flight.